This has been a lovely summer, despite the challenges. Each day is an opportunity. She inspired me with her lovely gift. 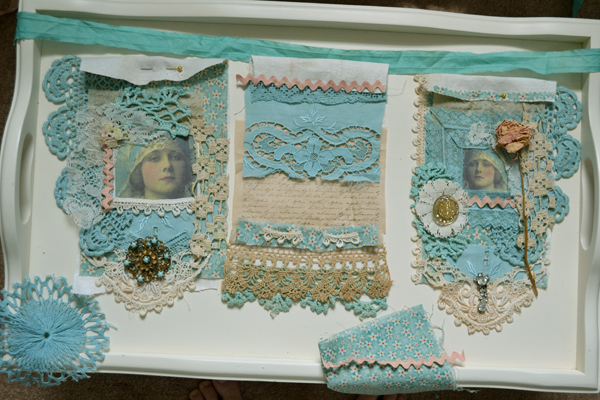 and I laid out my pieces. and added the final embellishments. and that the design changed somewhat. And that is o.k. with me. with all the odd shaped pieces of lace. and everything had to be lined up and straight! so the light shines through when I hang it outdoors. I broke my first needle and then switched to a jeans needle. use as a reference, I managed to finish my project. Where I had my tea two Tuesdays ago. Thank you Suzy for inspiring me! That is really sweet and I love the sentiment! Wowwwwwwww!! Just gorgeous!! 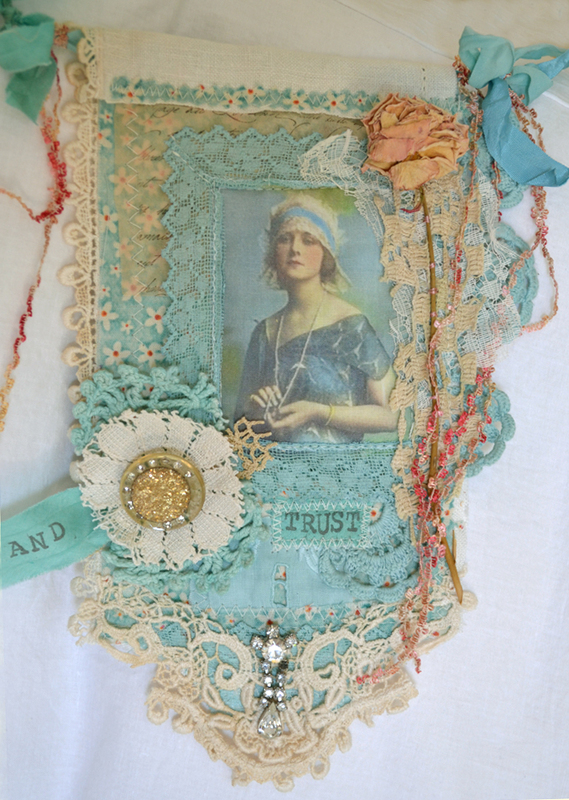 LOVING the colors and the vintage bits!! Very nice job Terri! I love the colors you made. Suzi is a very inspiring artist, and you realized a cute creation! I love the colors you chose for your fabric collage, it turned out beautifully and I'm sure it will be treasured for years to come. Hi Terry! Your fabric collage is spectacular! I love it! You are so talented! Thank you for sharing it. It inspires me to let go, something that I need to do. I am always so exact! I'm so tired of that. Oh Terri, I just love your new creations. I like the natural way they lie together, makes them even more special . Ah, these are BLUE and that means YOU! How gorgeous, Terri! The color combinations you used are too sweet! I can just see them hanging on the banister with a gentle breeze catching them. You've been busy, my friend.....and as always, your art is so inspirational. Hope you are having a good weekend, too. We got in a bike ride today (finally). I love your Suzy style collage Terry - just beautiful. how original! this is so beautiful, I love it! we are having a heatwave in europe, far to hot for me! What an amazing banner you have created dear friend. I just love it and the images and pretty color combinations just reflect the beauty within you! I have to say there are no rules when creating these collages - I just let my heart run with them until it all just looks and feels harmonious from my point of view. If it looks as perfect to you as you wish it to be then it is perfect. I can just visualize it flapping gently in the breeze. It is so very beautiful! Hi sweet Terri! Your work is absolutely beautiful and the colors look wonderful together :) Thanks for sharing with us and may you have a lovely day. This is so Pretty! Just Love it. 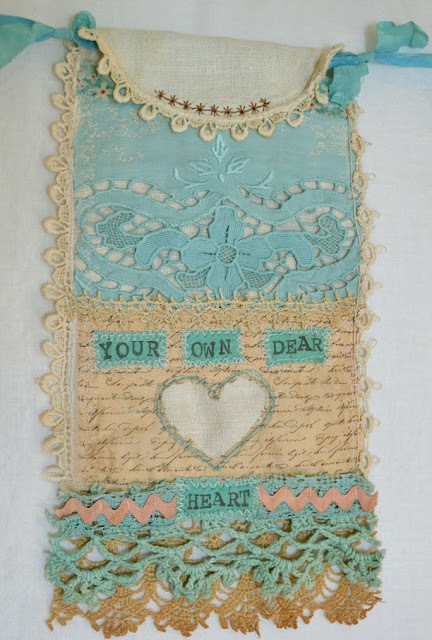 i really adore this piece.. the colors and the image are so perfect together.. and the heart.. ahhh i love hearts... this is such a delicate and heartfelt piece.. thank you so much for sharing with us. All of the pieces are perfectly beautiful and certainly nothing "wonky" about any one of them. 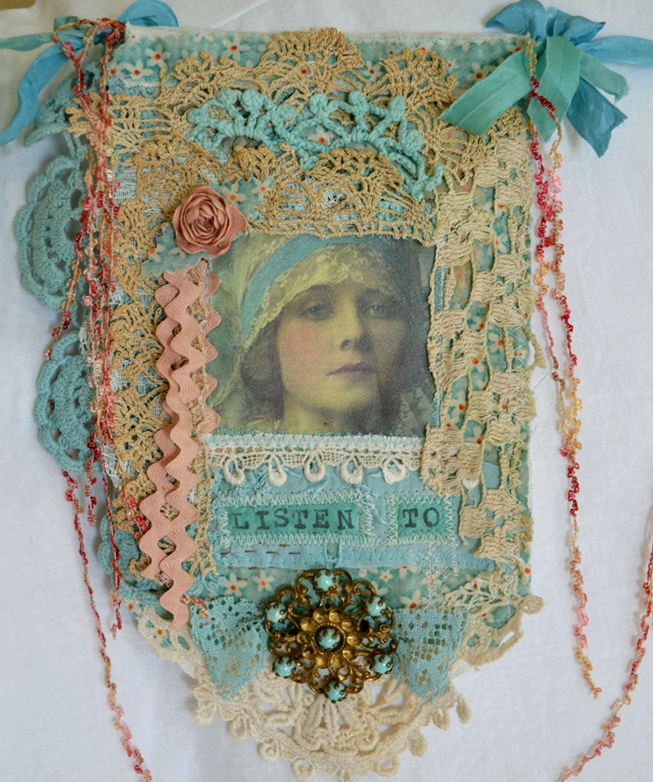 I too have been engaged in textile collage of late, including taking a class by Nellie Wortman via Creative Workshops. Oh but it is fun! 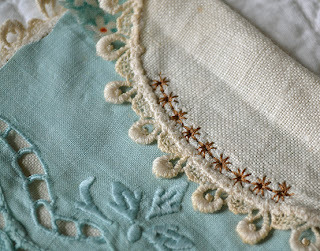 Your beautiful dying of your linens and laces is a totally fabulous thing. As ever, you rock! Each piece is beautiful! I know what you mean about trying to let go of the symmetry. I struggle with that, but I think you've managed it wonderfully! You made wonderful -not straight - flags, so lovely with your chosen images, the laces and ribbons. I love the colors you dyed with and I really love the way you put it all together. It is very "Suzy" and they show your creativity also. 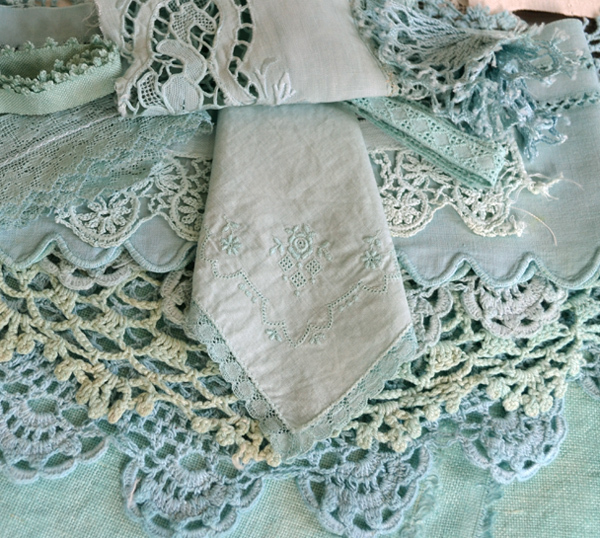 Terri, the banners are simply luscious with the gorgeous colors you have chosen and the designs! It is really incredible, over the top stunning in my book, and if there are bits of wonky then that is all the better, that is a part of you none of us are perfect, but I think these are just perfect! Hugs to you sweet friend! Visiting with you via your posts gives me such joy, dear Terri, and this one is no exception! Look at your beautiful work! You are an inspiration to me and your creation is so lovely...you'll have to share a picture once its installed! Your hand dyed pieces and art are AMAZING! I love the gorgeous colors you used. SO pretty!